Rabbits are very clean by nature – in the wild they relieve themselves in the same spots and don’t soil the inside of their burrows. Domestic rabbits too tend to deposit their urine and pellets in just one or a few places and respond well to housetraining. Some rabbits learn to use a litter tray by themselves but most need a little help from their carers. The majority of bunnies quickly learn to urinate in a tray, but will still scatter a few droppings on the floor. This is normal bunny behaviour and the dry, odourless droppings can easily be disposed of (see below). 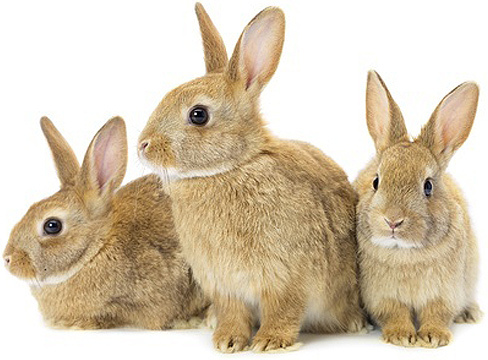 You can housetrain a rabbit when she is just a few weeks old; adult rabbits (over a year old) are often easier to train because they have already been through adolescence and are generally neater and more relaxed, especially if they are neutered. Neutering and spaying are essential if you are keeping your rabbit indoors. During adolescence rabbits become very restless and want to mark their territory with lots of urine and droppings. Even trained bunnies may lose their good habits and this may happen every Spring if your rabbit is not neutered. Neutering will also eliminate spraying over a period of a few weeks or months. It’s important to get your bunny used to his litter tray from the very first day, so make sure you have one or two trays ready when you bring your rabbit home. Providing more than one litter tray will increase your bunny’s chances of success. Later you can remove some of the trays – the ones your bunny uses less often. Buy litter trays with low sides for a dwarf or baby rabbit so he can hop in and out easily. For a larger bunny, use jumbo trays like those made for small dogs or adapt the bottom pan of a cage. A covered tray or one with high sides will keep the hay and straw contained if you use this type of litter. Alternatively, you can use a plastic dog bed, which combines high sides with easy access. It’s a good idea to start with one room even if you intend to give your rabbit the run of the house – if your bunny has too much to explore she will feel insecure and forget where the litter trays are. You can use the kitchen or another room with linoleum or wooden floor. If all your rooms are carpeted choose a small room so your rabbit is more likely to find the litter trays. Put one litter tray in your bunny’s cage or near his bed and a second in a corner of the room or between a piece of furniture and the wall. Leave a few droppings and a piece of urine-soaked paper inside the trays so your rabbit gets the idea. If your bunny hops into the tray, give him lots of praise and maybe a treat. Otherwise herd him gently towards the tray or lure him there with a favourite piece of food. Your rabbit is more likely to use the litter tray if you make it a nice place to be. Put a handful of hay or even her food bowl in one corner. Don’t do to your bunny things that she doesn’t like or disturb her while she is in her tray or cage. Try different types of litter to find the one your bunny prefers. Many rabbits like digging and rolling in their trays, grooming or even taking a nap. This is wonderful behaviour – if your rabbit likes spending time in her litter tray, she’s more likely to mark it with urine and droppings. In the early days it is very important to be vigilant and follow your bunny everywhere; rabbits are creatures of habit and once they get used to urinating in the wrong places it is more difficult to stop them from doing so again and again. When you see your bunny pushing his bottom and tail out, it is usually a sign he is about to urinate. If your rabbit is in the tray, wait until he has finished and give him lots of praise and a reward. If your rabbit isn’t in the tray, say: “No, X” (where X is your bunny’s name) firmly but without raising your voice. Then gently pick up your rabbit and put him in the litter tray. If your bunny doesn’t like to be handled, you will need to coax him there with a food reward. Never trap or chase your rabbit then put him in his cage or litter tray or you will make this look like punishment. Once your rabbit is in the tray give him the treat and lots of praise. Your rabbit may hop back out and pee on the floor. Be patient – litter-training doesn’t happen in one day! Dogs and cats too may need several weeks or months to become housetrained. It’s important to say “No” every time your bunny urinates on the floor (not just occasionally). However, remember to do this immediately after the event or your bunny will forget all about it and your words will just upset and confuse her. Needless to say, you should never scold or smack your rabbit, no matter how lightly. This will not help with housetraining and will terrify your bunny companion. Many rabbits prefer finding their own spot (behind the sofa, under a chair or table, in a corner of the room) for doing their business. Simply move the litter tray where it is needed. Even if this means rearranging a piece of furniture, it is easier than working against a determined bunny. Clean up the puddle well to remove odours and leave some urine and droppings inside the tray. This will hopefully encourage your rabbit to use the litter tray next time. As your bunny becomes more reliable you can gradually give him free run of the house (do one room at a time). It’s a good idea to have a litter tray in every room, at least in the beginning. When you are not at home or you don’t have to supervise him, put your trainee in his cage or leave him in a small uncarpeted room to contain the number of “accidents”. Urinating in the spot where the litter tray used to be. When litter-training your bunny it’s a good idea to put the trays where he likes to urinate. Once your rabbit has got used to urinating in the tray, you can gradually move it where you want it to be. If your rabbit continues to soil in the old place, clean the area thoroughly and cover it if possible (with furniture, a box, etc.). Put some urine/droppings in the tray and a favourite treat or toy in one corner to encourage the bunny to use it. Kicking the litter out of the tray. If your rabbit loves kicking the litter all over the floor try using a different type of litter or buy a litter box with a covered top like the ones used for cats. Urinating over the edge of the tray. Invest in a bigger tray or one with higher sides or use a covered box as described above. If the litter tray is in he kitchen or bathroom, push it against a tiled/washable wall to encourage your bunny to stay in the middle of the tray when he urinates. Urinating in the bathroom. Some rabbits are attracted to the smell of human urine in the bathroom and like doing their business near the toilet (the fluffy carpet around the toilet is a favourite spot). If this is the case wash the floor/carpet thoroughly so your rabbit cannot smell his urine and is less likely to soil there in future. Then provide a litter tray with some droppings and a piece of urine-soaked paper inside. Urinating on rugs or mats. Our bedside rug was a favourite peeing spot when my house rabbit was little. I had to have it dry-cleaned all the time, which cost me a small fortune, and in the end I threw it away. Fortunately, my rabbit stopped urinating there after that. If you want to keep your rug, wash it well to remove all smell of urine, then put a litter tray on top of it. Leave some soiled litter inside the tray to help your bunny get the message. Later you may be able to move the tray away from the rug to a more convenient place (do this very gradually). This also applies to other unsuitable spots where your rabbit tends to urinate (e.g. a doorway). Urinating on beds, sofas, etc. Rabbits love to urinate on beds and sofas because they are soft and comfortable and have a strong human scent. If your bunny tends to relieve herself on your bed or favourite armchair, establish right from the start that these are no-go areas. It will help to teach your rabbit the “No”/”Down” command. When you see your bunny is about to urinate on the bed/sofa, clap your hands to get her attention and say “No” as described above, then push your rabbit gently towards the floor. Make sure there is at least one litter tray in the room, ideally near the bed, sofa, etc. and encourage your bunny to use it with he help of a food reward. If she is very tame, pick her up and put her in the tray, then give her lots of praise. Clean the stain thoroughly to get rid of the smell of urine; remove any droppings from the sofa and put in the litter box. One of our volunteers has resorted to leaving a litter tray on her sofa bed – although not ideal her rabbit has quickly taken to it and has stopped soiling the bed. If your bunny continues to urinate on your sofa or bed, simply keep the doors closed to prevent access to your bedroom or living room. This is particularly important if an accident is likely to upset you. Is also a good idea to protect your mattress/sofa with a waterproof sheet. You can then cover the sofa with a washable throw (buy two throws so your sofa is covered while one is in the wash). Be patient if your rabbit is a bit messy – some rabbits take longer than others to refine their litter-training. You may be giving your rabbit too large a territory or not enough litter trays for his needs. Concentrate on urine rather than pellet training and reward your rabbit every time she does well. If your bunny isn’t neutered arrange for it to be done as soon as possible, however expect that it may take a few weeks or months for her behaviour to improve. • A wooden box with a hinged roof (to make cleaning-out easier) or, as a temporary measure, a strong cardboard box lined with lots of newspaper. • A covered litter box (like the ones used for cats). • An untreated straw/wicker basket, for instance a baby Moses. Line the bottom with a bin bag and a layer of newspapers, then fill with hay/straw or another type of litter. • A small plastic dog bed. • Anything else your bunny may like to use, including his travel cage. Experiment with different kinds of litter – rabbits have definite preferences in these matters. Provide multiple litter trays to help your rabbit get it right. While your bunny is still in training, keep her in her cage or a small easy-to-clean room and set up an exercise area on your balcony/terrace or in the garden. Urine. If your bunny has urinated on the sofa/carpet, etc. absorb as much urine as possible using an old towel or a few sheets of kitchen roll. Wipe the area with sodium bicarbonate or diluted white vinegar, which neutralises the smell of urine. Mop up puddles on linoleum and wooden floors with warm soapy water, using undiluted white vinegar to remove stubborn stains. Remember hat rabbit urine has a strong smell and can stain furniture, fabrics, painted surfaces, etc. so clean up as soon as possible. Droppings. Uneaten soft droppings can be removed with a tissue or piece of toilet paper and flushed down the toilet. Dry pellets can be picked up with a tissue or a dustpan and brush and thrown in he toilet/dustbin or used in the garden as a fertiliser. You can also vacuum up dry pellets with a hand-held hoover (empty he contents straight away so they don’t become mouldy or smelly). Litter trays. Depending on how often a tray is used and how many rabbits share it, change the litter every 1-2 days and rinse the tray in warm soapy water. Calcium deposits on the bottom of the tray can be removed by letting the tray soak in white vinegar. Written by Carolina James, published in The Rabbit Issue 2, Volume 1 Spring/Summer 1998, published by The Rabbit Charity.